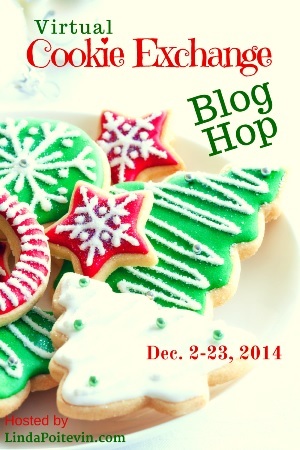 We interrupt this regularly scheduled blog to bring you… cookies! And fudge! And snackables! My blogging buddy Linda Grimes invited me to participate in a virtual cookie exchange, and being the foodie I am, I couldn’t resist. I promised her my simplest no-cook 3-ingredient fudge and a couple of other super-quick recipes that make you look like a holiday hero for making goodies from scratch. Author Linda Poitevin is hosting this festival of yumminess. Here’s a list of all the recipes so far, and she’ll be posting another update today and again next week. Here you go – happy snacking! Instructions: Melt everything together, stir well, and pour into greased 9×9 pan. Chill. Eat. *Tip for holiday heroes: You can make this into any kind of fudge you want – just use a different kind of chips. White chocolate, milk chocolate, butterscotch, whatever. If you want to be fancy, throw in some chopped nuts, crushed candy canes, dried cranberries, chopped-up candy bars, or whatever else moves you. If you want to go all Martha Stewart and give homemade fudge as a gift, make a double batch and chill it in a parchment-lined loaf pan, then slice it into slabs the way the fudge shops do. Instructions: Melt the first 3 ingredients together, stir in the icing sugar, and press into greased 9×9 pan. Chill. Eat. *Tip for holiday heroes: Make the peanut butter fudge first, then make a batch of chocolate fudge and spread it over top. Choco-peanut-butter fudge, hello. This almost fills the 9×9 pan, so if you like your fudge a little thinner, put it in a 9×13 pan instead. Instructions: Throw everything in a paper bag* and shake well. Pour out. Eat. *This recipe might sound kinda gross to those who don’t like ranch flavour, but it’s irresistible if you like tangy, crunchy, salty snacks. And you can shake it up in anything you have handy – a turkey roaster or covered pail or whatever. Since this is actually supposed to be a cookie exchange, here are my favourite molasses spice cookies. They do require baking so they’re not quite as fast and simple as the first three recipes, but they’re soooo worth it! Instructions: Mix the first 4 ingredients together, then add the rest and mix well. Roll into teaspoon-sized balls*, dunk in sugar, and place on a greased baking sheet. Flatten with a fork* and bake at 350 degrees approximately 12 – 14 minutes or until lightly browned. *Note to Linda Grimes – I know this one has more ingredients than you want to deal with, but you gotta give me credit – continuing in your fine tradition, I said “balls” and “fork”. Okay, you get a pass on the extra ingredient. Plus extra credit for the balls and fork. 😉 I may actually try to make both kinds of fudge. Or possibly I’ll wait until my daughter is here, and let her do it. Yeah, that sounds better. She actually likes kitchens. These look yummy. I made some ginger snaps over the weekend, but they’re more chewy than snappy which I like, so maybe they’re similar to your chewy molasses spice cookies. I still have a couple things left to make (family coming for Christmas), but I’m getting there!